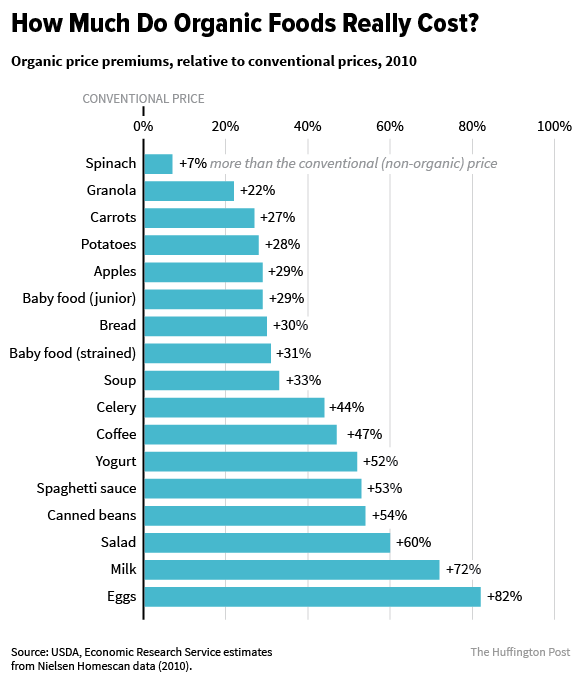 Here's how organic food compares to conventional alternatives. Buying organic food typically involves shelling out a premium. But is the extra pinch to the pocket actually worth it? Last week, a Department of Agriculture report revealed just how much it really costs to shop organic. Organic eggs, milk and salad greens can cost upwards of 60 percent more than conventional alternatives, while items like apples, carrots, granola and spinach carry premiums of between 7 and 30 percent, the study said. Producing organic food tends to be costlier along every part of the supply chain -- including farming practices that usually require greater labor inputs and segregating organic ingredients from conventional ones. Though there may be logical reasons for the heftier price tag, does it really make sense as a consumer to pay more for organic food? The answer, it turns out, is anything but straightforward. Here, we explore this hotly contested issue. What the heck does organic mean anyway? Organic produce, according to the USDA, must be grown without synthetic pesticides, synthetic fertilizers or genetically modified organisms. Organic meat has to come from animals that were raised in a natural setting, didn't receive any antibiotics or hormones, and were fed 100 percent organic feed. “By this general definition, [organic food] should be friendlier to the planet and pose less harm to human health,” Chensheng Lu, an associate professor of environmental exposure biology at Harvard University, told The Huffington Post over email. Indeed, there’s some evidence that organic labels may not always be reliable. A major issue, experts say, is a lack of a robust monitoring system to keep track of whether products that say they're organic really are. Still, despite a flawed system, there do appear to be measurable differences between foods labeled organic and those that are not. A 2012 meta-analysis published in the Annals of Internal Medicine comparing organic and conventional foods, for example, found that exposure to pesticide residue was more than five times higher in conventional produce. A 2014 study found that organic foods had significantly lower levels of toxic metals compared to conventional alternatives, and “substantially higher” levels of antioxidants. So, what does this mean for human health? Pesticide exposure has been linked to all kinds of health conditions, from neurodegenerative diseases like Parkinson's to cancer and birth defects. The jury, however, is still out as to whether or not the pesticides found in conventional foods are present in large enough quantities to actually make a difference to human health. In the 2012 meta-analysis, conventional fruits and vegetables were found to have far more pesticide residue than organic produce, but the levels were almost always under the maximum amount allowed by the Environmental Protection Agency. Some organic food skeptics have also pointed out that non-synthetic pesticides are used on some organic farms as well -- and the science is still hazy as to whether or not those compounds have ill effects. When it comes to the nutritional value of organic food, there's also conflicting data. The 2012 meta-analysis did not find any significant nutritional differences between conventional and organic foods. A meta-analysis published two years later in the British Journal of Nutrition, however, found that organic produce may have substantially higher concentrations of antioxidants and other potentially beneficial compounds. A recent study, published in February, concluded that organic dairy and meat contain about 50 percent more omega-3 fatty acids. As for antibiotic use in food animals, the problems are more clear-cut. The Centers for Disease Control notes that "[s]cientists around the world have provided strong evidence that antibiotic use in food-producing animals can have a negative impact on public health" because the drugs allow antibiotic-resistant bacteria to develop. So choosing organic meat, or meat raised without antibiotics, is better than conventional when it comes to this issue. When considering the benefits of organic food, it can be tempting to focus on the impacts of such products on human health. But as Marion Nestle, author of Food Politics and professor of nutrition at New York University, noted, choosing organic has implications for the Earth’s well-being, too. According to the Food and Agriculture Organization of the United Nations, an agency dedicated to addressing world hunger, there are many environmental benefits of organic agriculture, including long-term sustainability, greater biodiversity and better soil health. But organic farming still isn't perfect. One meta-analysis found that though organic farming practices had fewer environmental impacts per acre, this was not necessarily true per product unit. Though the health impacts of conventional foods on consumers remain unclear, the detrimental effects of pesticides and other chemicals are more clearly documented in the case of farmworkers. There's also some evidence that people living in farm communities are at risk for chronic health problems as a result of chemical exposure. Pesticides used in strawberry farms in California, for instance, are associated with an increased cancer risk among children living in those areas, according to the Department of Pesticide Regulation. Lu said choosing organic can also have positive impacts on the food industry at large. According to Food and Water Watch, economic power in the agriculture and food sector is unusually concentrated. The four largest companies, for instance, control 85 percent of soybean processing and 82 percent of the beef packing industry -- an oligopolistic situation that’s economically harmful for both farmers and consumers. “Communities with more medium- and smaller-sized farms have more shared prosperity, including higher incomes, lower unemployment and lower income inequality, than communities with larger farms tied to often-distant agribusinesses,” the nonprofit writes. Many organic farms are small operations, though "big organic" farms do exist as well. If buying from a small farm is important to you, one option is to seek out a local farmers market, where you're often able to speak directly with a person who helped grow your produce. For produce, buy organic if you're planning to eat the skin of the fruit or vegetable. The Environmental Working Group's “Dirty Dozen” and “Clean Fifteen” lists are helpful resources on this front. The first highlights conventional produce with the highest pesticide loads (such as strawberries, apples, nectarines, grapes and spinach). The “clean” list, on the other hand, catalogs produce least likely to hold pesticide residues. These include avocados, sweet corn, pineapples, cabbage and cauliflower. Buying local food is a community investment, Grubinger adds -- a way to not just support local businesses, but also to protect local ecosystems and help communities become more self-sufficient. It also supports a more sustainable food system by significantly minimizing the use of fossil fuel-based transportation. It's estimated that the average American meal travels about 1,500 miles to get from farm to plate, according to the Center for Urban Education about Sustainable Agriculture. In contrast, locally sourced food can travel 200 miles or less. Many mainstream supermarkets, including Safeway, Target, Wal-Mart and H-E-B, carry organic store-brand options, while Costco, Sam's Club and BJ's sell organic foodstuffs in bulk. Some supermarkets, like Whole Foods, also have bulk bins stocked with organic grains, dried fruit, coffee and other products. 5. Grow your own food. It might sound daunting, but growing your own produce isn't as difficult as it sounds. It just requires a bit of effort and patience. Good Housekeeping has some tips on how to start your own organic garden. Live in a small apartment? The Urban Organic Gardener website's got you covered. So is buying organic worth it? Depending on your priorities, it might be. Ultimately, many experts agree that eating a balanced diet, while remaining conscientious about how your food choices impact the health of the planet and farming communities, is key. And if you're not able to pay for that fancy, organic apple, a fear of pesticides shouldn't be a barrier to consuming lots of nutritious produce. “Eating fruits and vegetables is good for health, whether organic or not,” said Nestle.